↑ Drag up to your Bookmark Bar. The bookmarklet lets you quickly save a web page while viewing it. 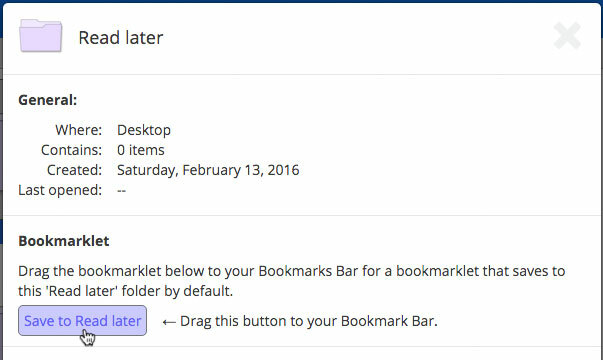 Drag the bookmarklet below to your Bookmarks Bar. Then simply click it when you’re viewing a web page. A popup will appear, allowing you to choose a destination folder and save. Save to Bookmark OS← Drag this button to your Bookmark Bar. Each folder that you create has it's own bookmarklet that can be used to quicky save web pages to that folder. 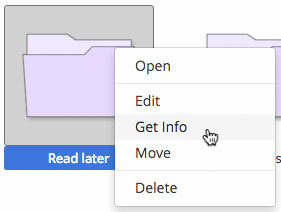 For example, if you have a 'Read later' folder, you can add a 'Save to Read later' bookmarklet to your Bookmark Bar. When you click the 'Save to Read later' bookmarklet, the 'Read later' folder will be selected by default, allowing for quicker saving. To access, right-click a folder, select 'Get info' from the context menu, and look at the Bookmarklet section below General.